Each Friday, March 8-April 12, from 8:30 am-11:30 am, in our Chapel Room--except for April 5 when Adoration will take place in the church. 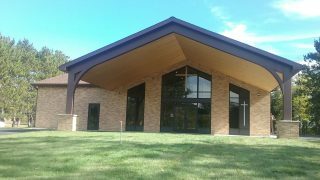 Adoration at our sister parish (in Our Lady's Chapel), Immaculate Heart Church, at 35208 County Rd #37, in Crosslake, MN. Eucharistic Adoration is for everyone! It is a source of great nourishment for your heart, soul, mind, and body. It is a time in which you can pray or simply rest in the arms of Jesus and Mary. There are no rules for your time with Jesus--just be with Him! Monthly 24-hour Adoration--Exposition after the 8:00 am Mass on the first Thursday of the month and Benediction on the first Friday at 10:00 am. Eucharistic Adoration on the other Thursdays of the month begin with Exposition after the 8:00 am Mass and Benediction at 6:00 pm. 24-hour Adoration for our cluster during Lent is each Thursday at 8:30 am through Friday at 10:00 am, March 6-April 12. If you would be interested in signing up to be a guardian during one of the hours of Adoration, please contact Marilyn Lessard at dre.marilyn@gmail.com or call 218-692-3731. Watch our bulletin for expanded hours of Adoration during Advent, Lent, and summer months.